The luxurious Battambang Resort has been warmly welcoming guests for a little more than 5 years now, establishing its reputation as a small piece of paradise right here in Cambodia. The beauty of Battambang provides the perfect setting for this very special resort. Located in the midst of countless serene rice fields, local farmers can be seen tending to their daily work not far from the ancient village and famous bamboo train. Guests at Battambang Resort can unwind after a busy day’s sight-seeing by taking a dip in our refreshing salt water pool or perhaps enjoy some soothing relaxation time in the jacuzzi. Step out of the pool and step into our fantastic restaurant located on the first floor of the complex. 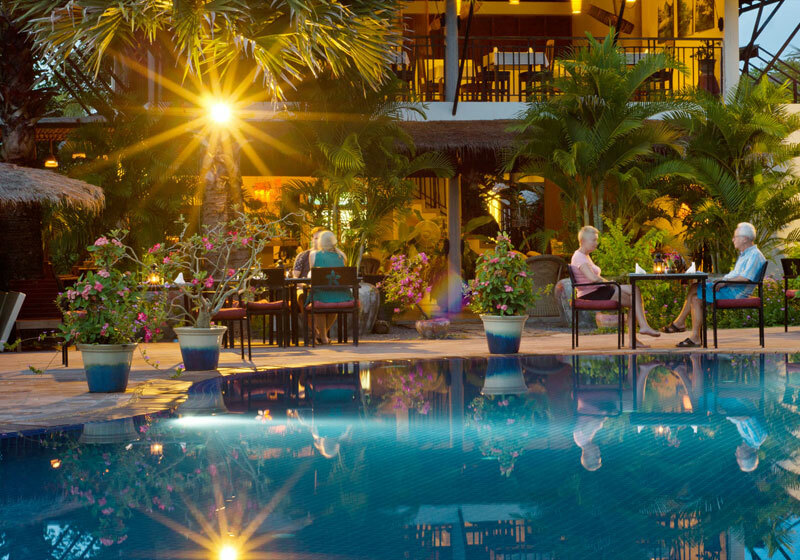 From the comfort of the restaurant guests can enjoy fine views of the spacious tropical gardens, also an ideal place for taking a tranquil after-dinner walk. Short Description: The luxurious Battambang Resort has been warmly welcoming guests for a little more than 5 years now, establishing its reputation as a small piece of paradise right here in Cambodia.